Looking to upgrade your computer? The VisionTek Clone Kit with EZ Gig IV enables you to clone your hard drive in just three clicks without opening your PC. Our Cloning software is a powerful, yet easy to use tool that gives you the option of creating an exact clone of your hard drive. Perfect for hard drive upgrades or for creating bootable backups of your system OR for those who wish to clone to a smaller capacity drive, such as a fast solid state drive. 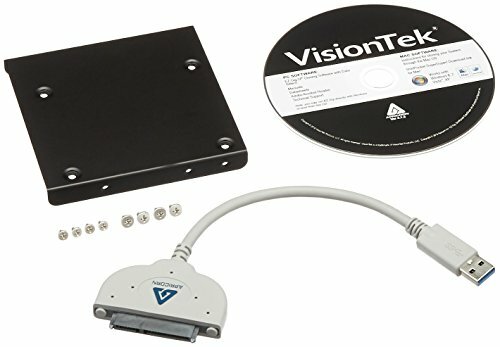 The VisionTek Hard Drive clone kit is the perfect tool to transfer and clone your Hard Drive no matter what brand 2.5-Inch SATA Solid State Drive you own or what operating system you use! Perfect for use with the VisionTek Racer and GoDrive Series Solid State Drives. If you have any questions about this product by VisionTek, contact us by completing and submitting the form below. If you are looking for a specif part number, please include it with your message.